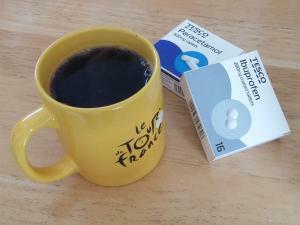 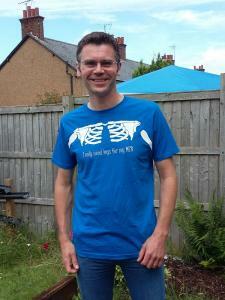 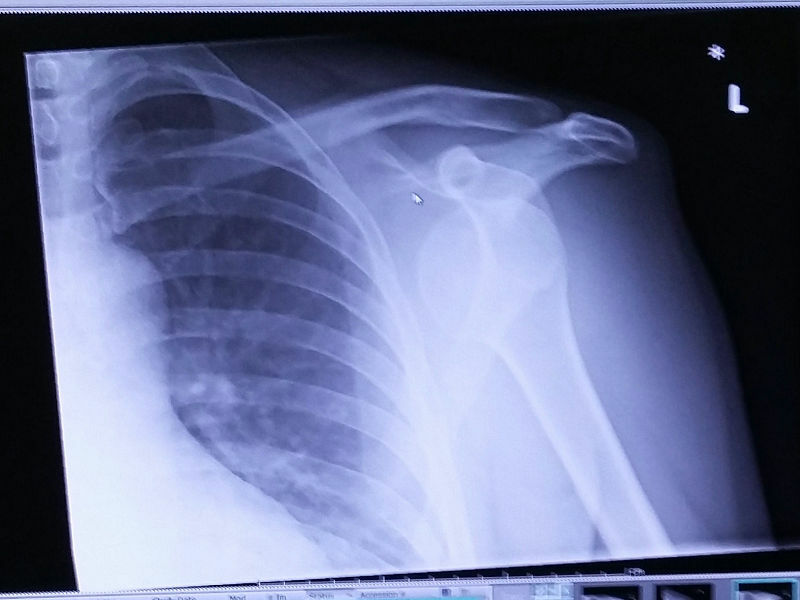 The year of my dislocated shoulder! 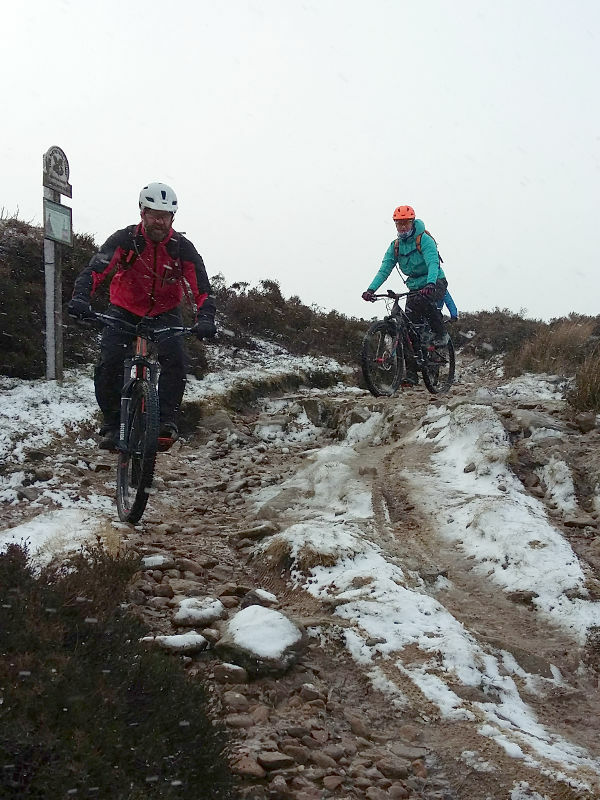 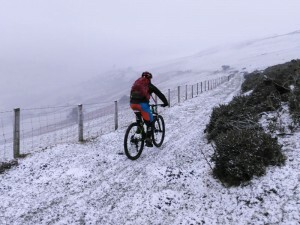 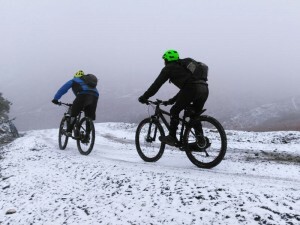 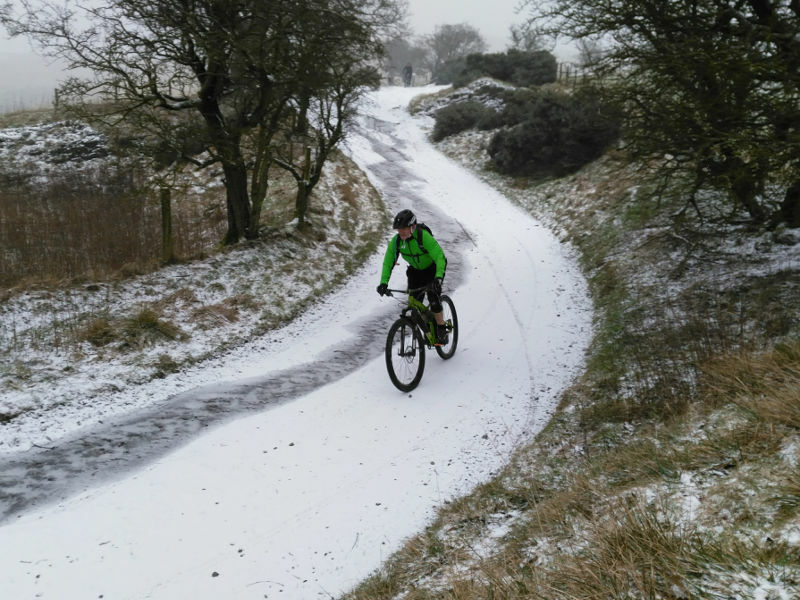 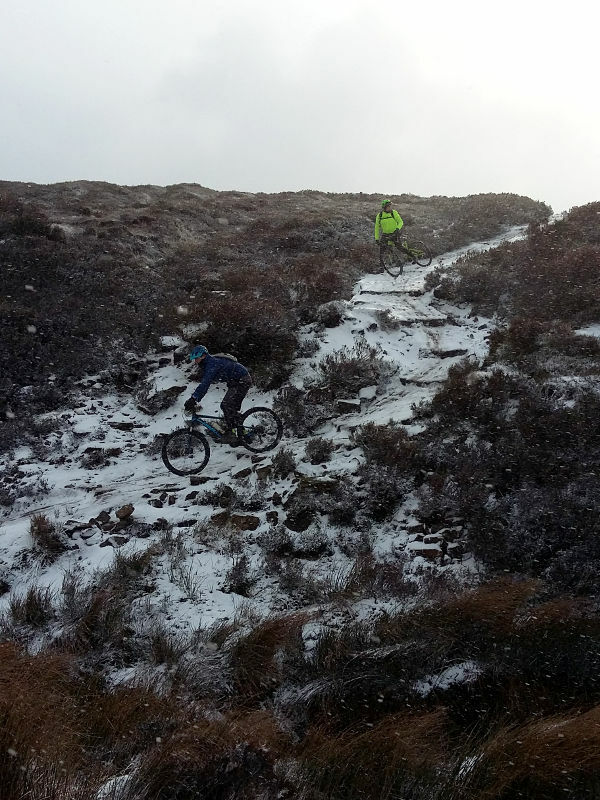 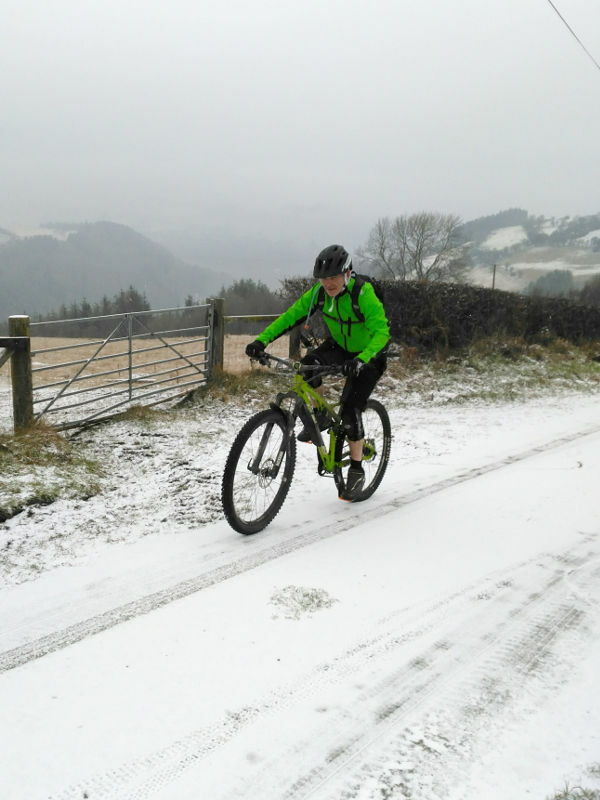 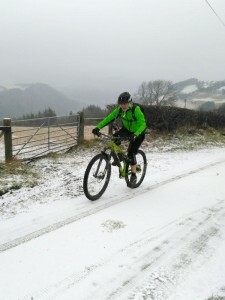 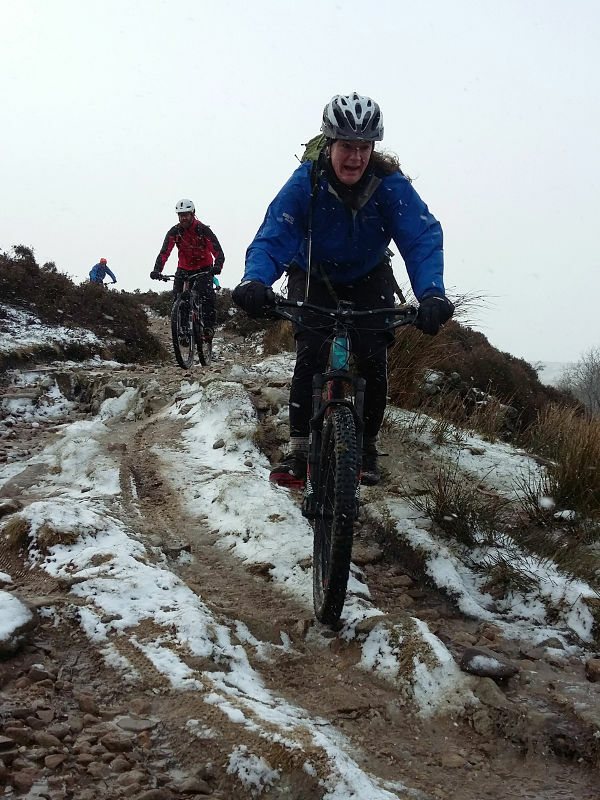 Unexpected snow, given the surrounding weather and the forecast, made this a spectacular ride around the Ceiriog Valley. It's a stunning area with some great trails, which was made even more fun by the white stuff. 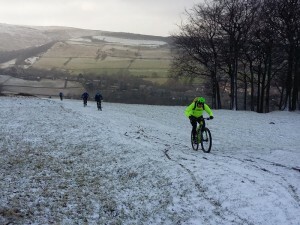 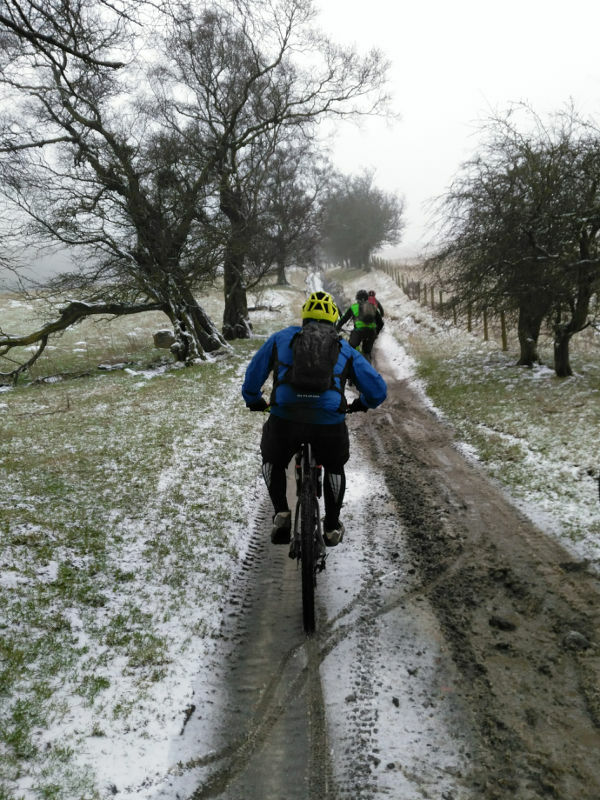 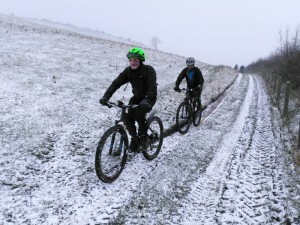 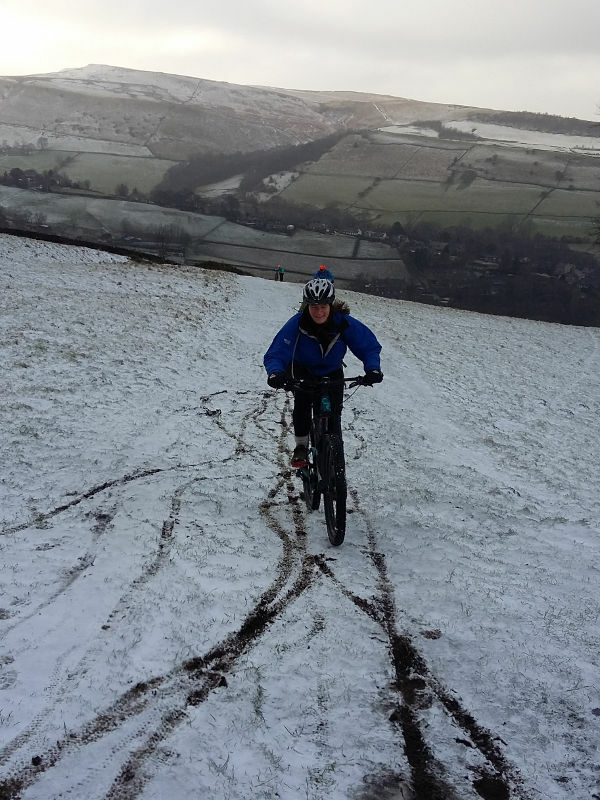 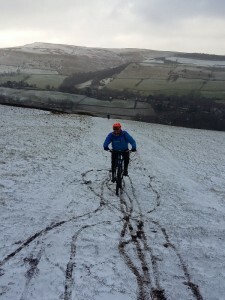 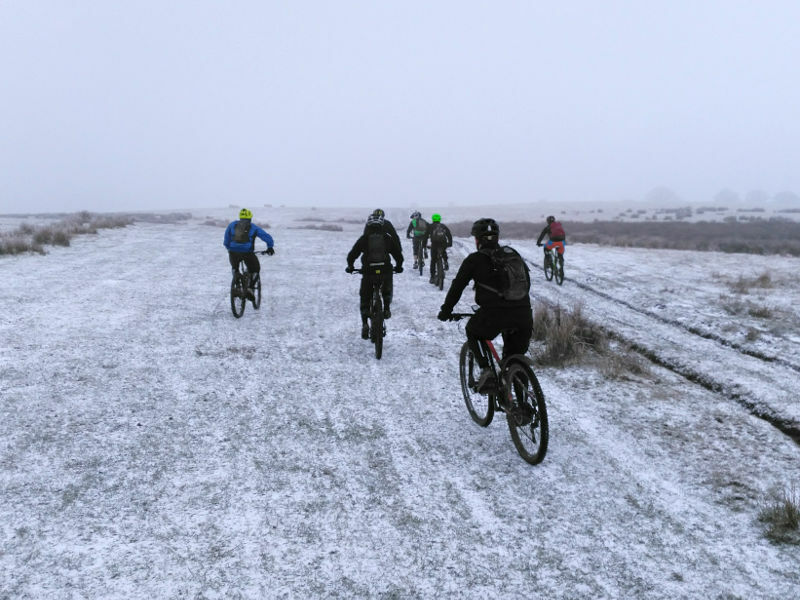 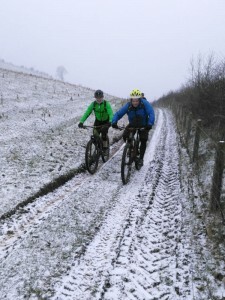 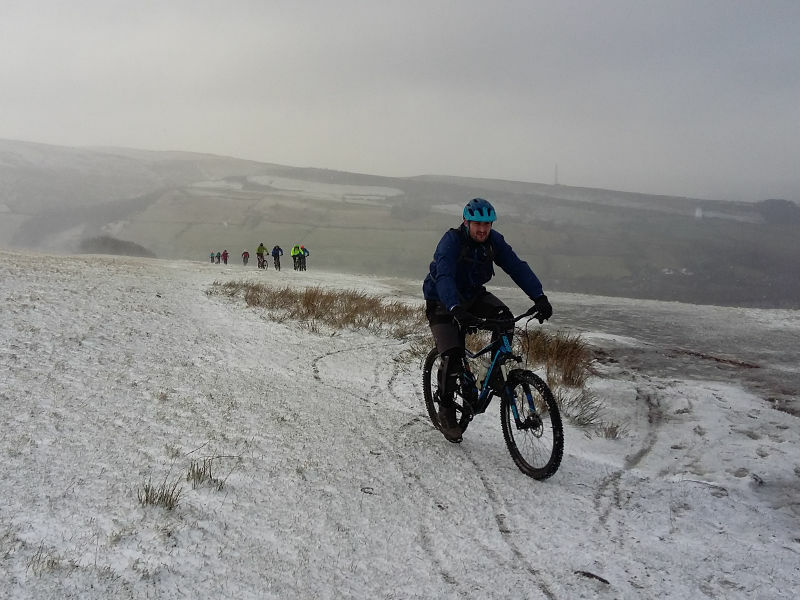 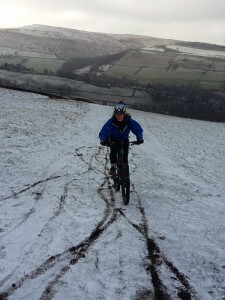 This Social ride around Hayfield was definitely one of the most wintery I have ever done. 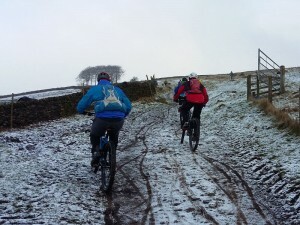 Despite the lack of feeling in our fingers and toes we all still managed to have a very enjoyable ride. 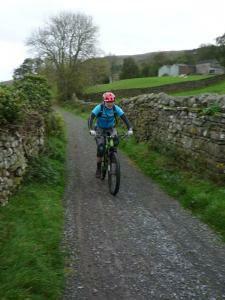 There are only pictures of the first half because after that I wasn't taking my hand out of my glove again! 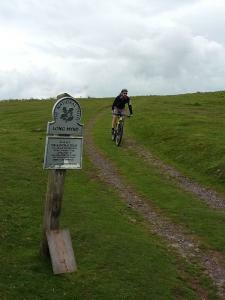 On this ride we followed my Rowarth Route. 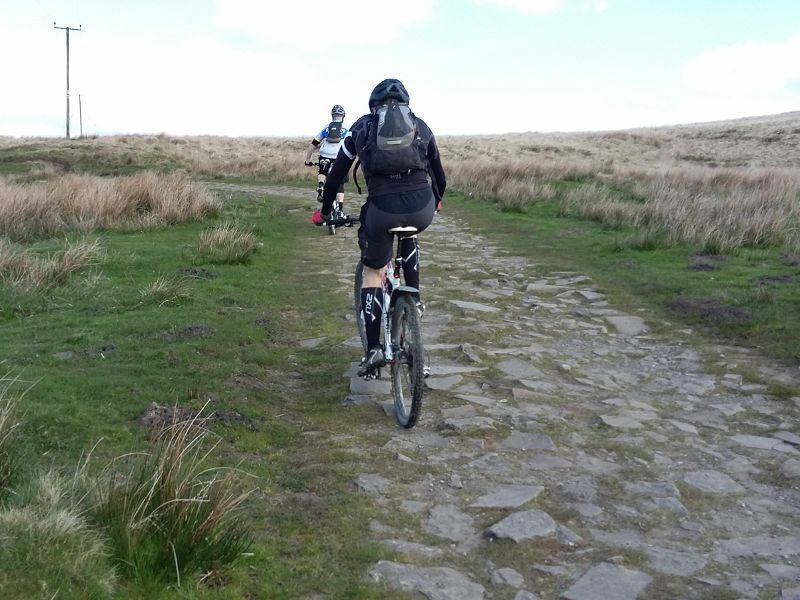 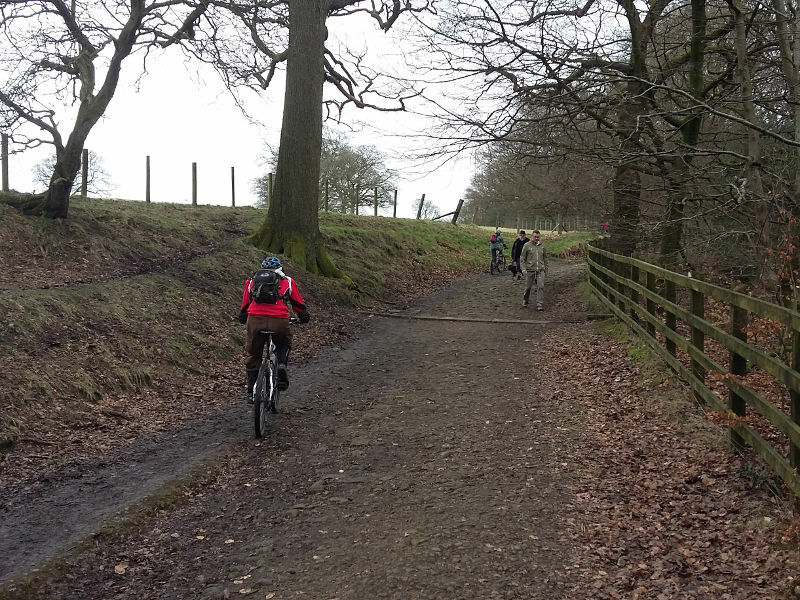 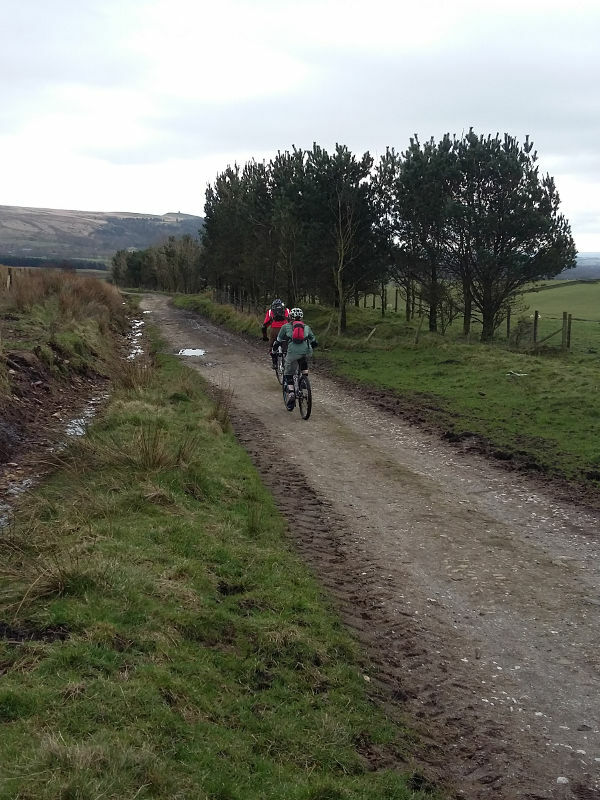 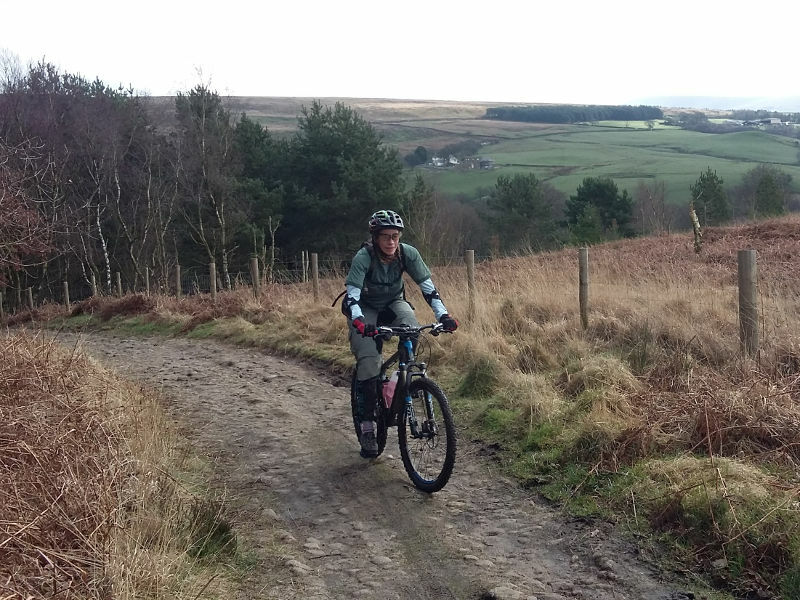 It was great riding around my Rivington Pike route with Kath and Mike but a shame family and work got in the way of the six other riders who were due to come. This it meant I could have a good chat with Kath and Mike though, rather than my usual rushing back and forward with a bigger group. 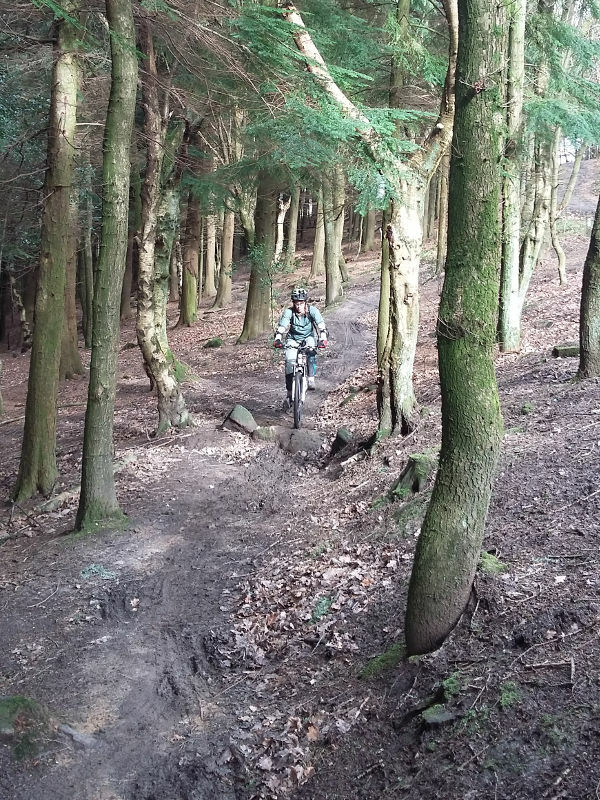 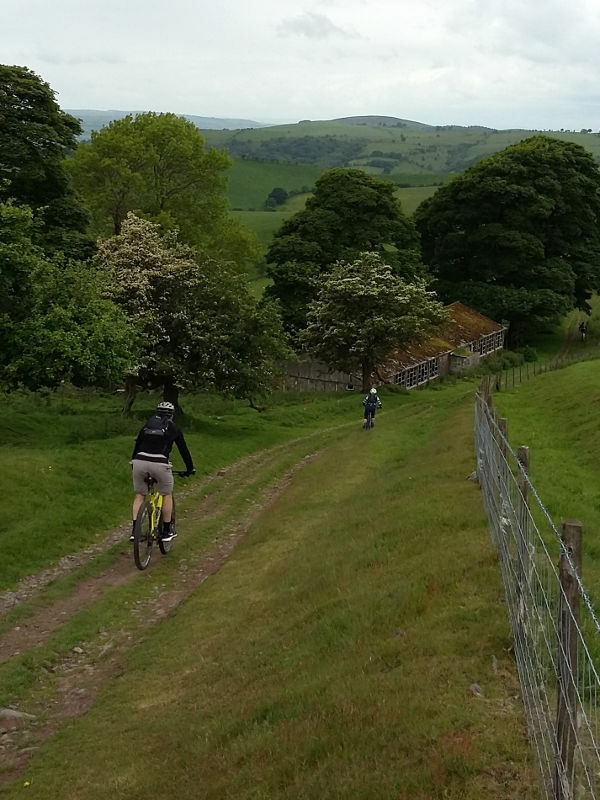 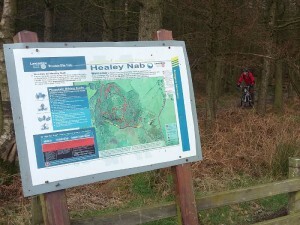 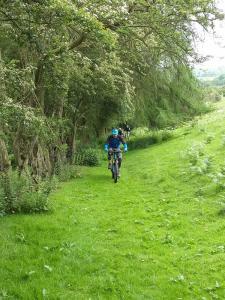 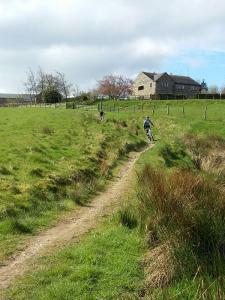 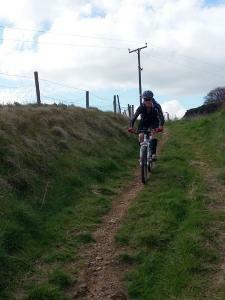 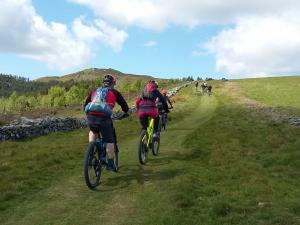 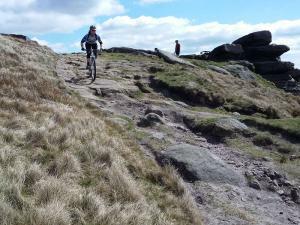 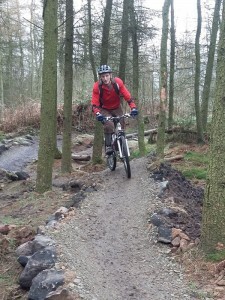 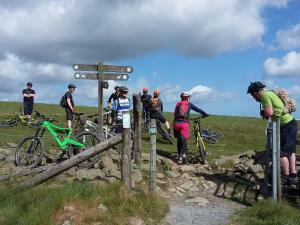 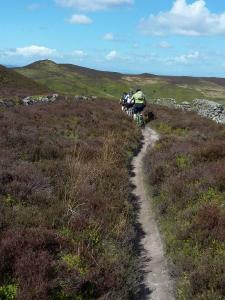 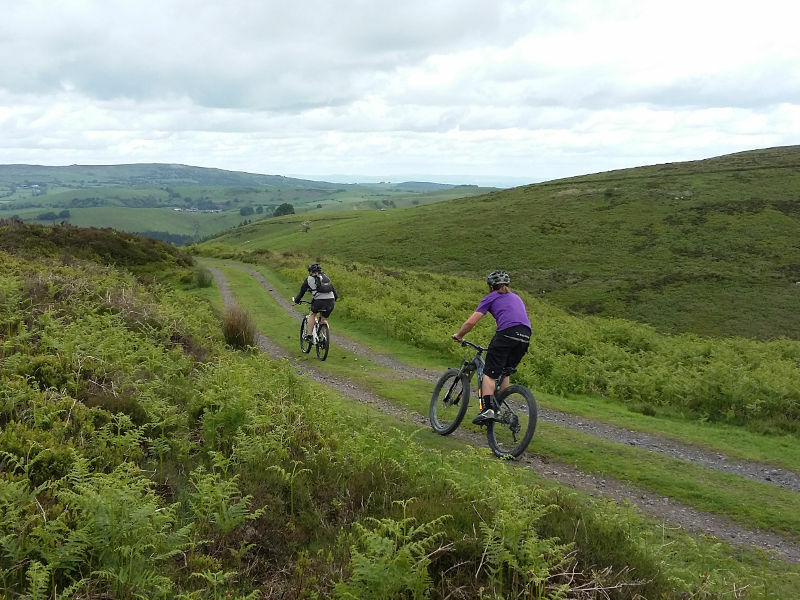 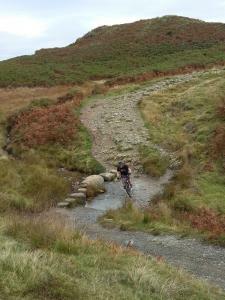 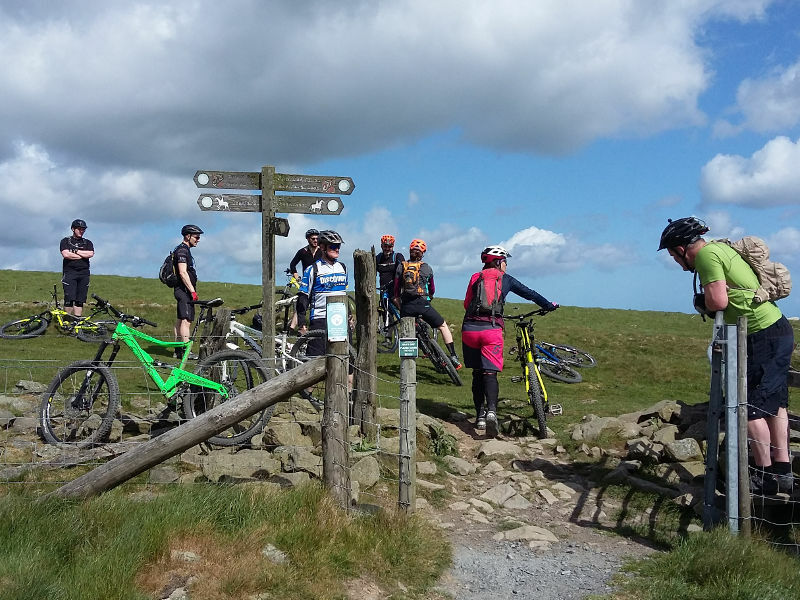 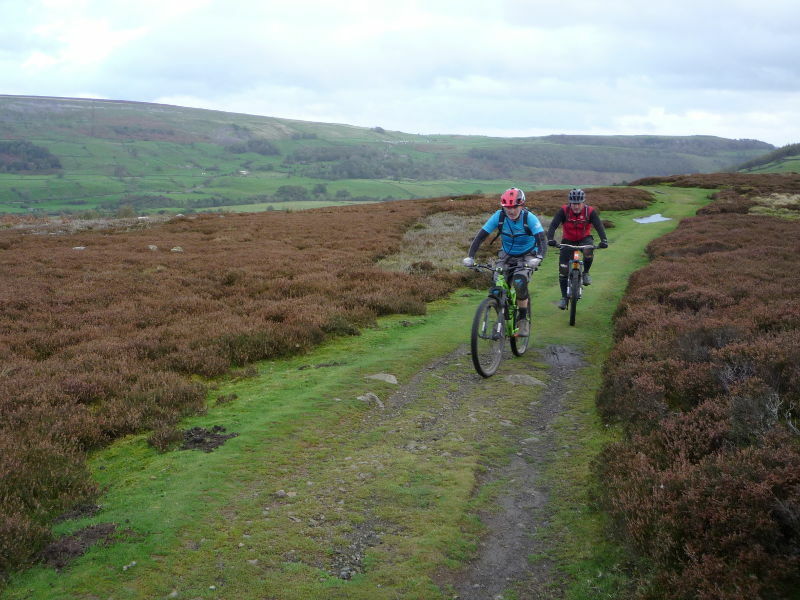 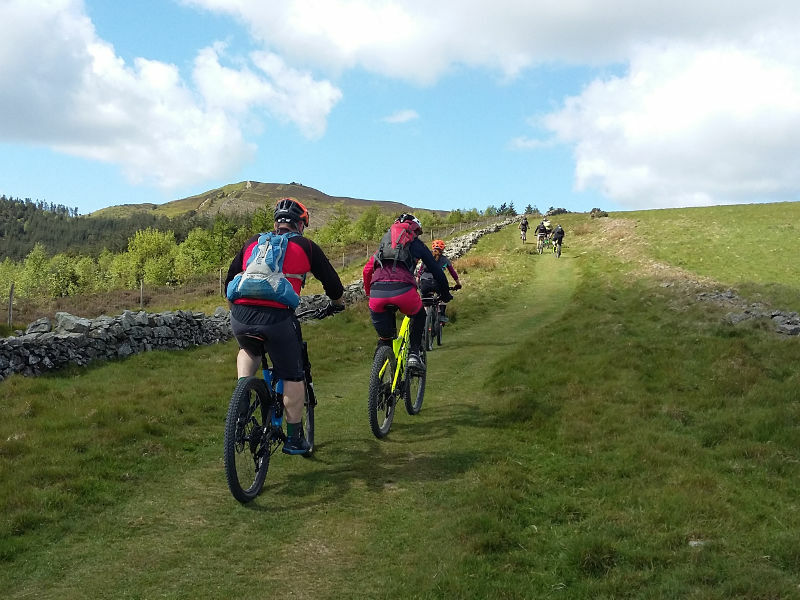 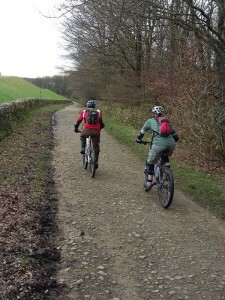 The route was made even better, as this was the first time I got to ride the Healey Nab MTB trails. 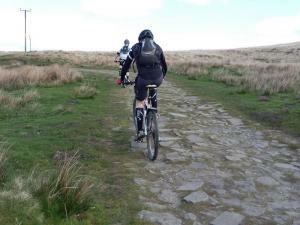 On this ride we followed my Rivington Pike route. 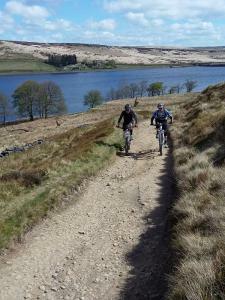 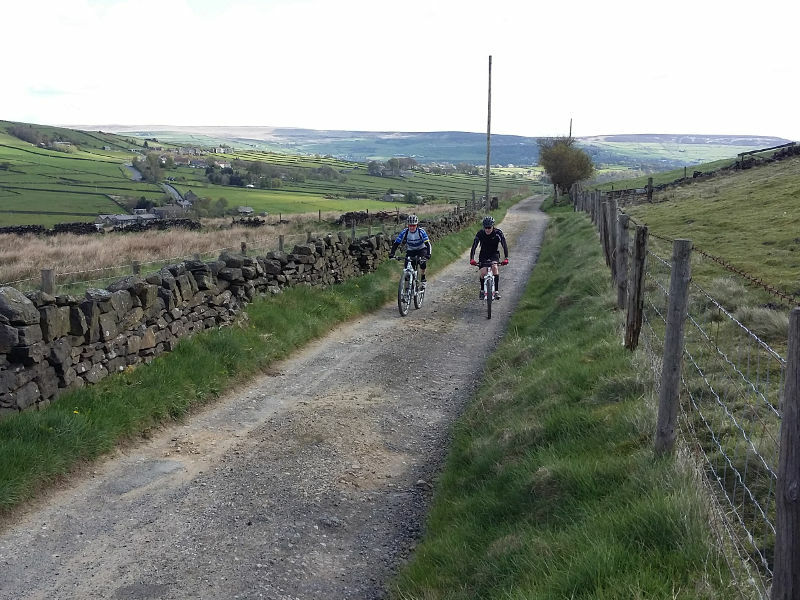 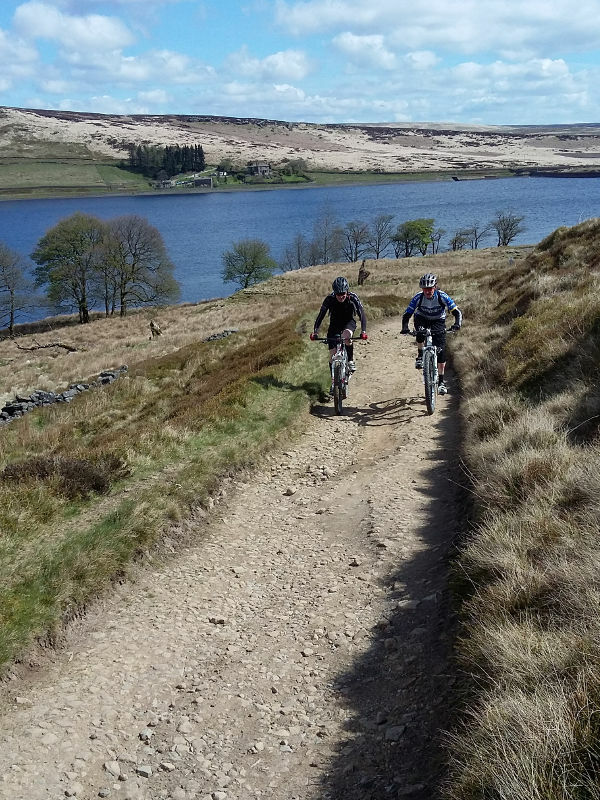 I had a great ride around Hebden Bridge with Laurence and Paul. It was sunny, dry and not too hot. 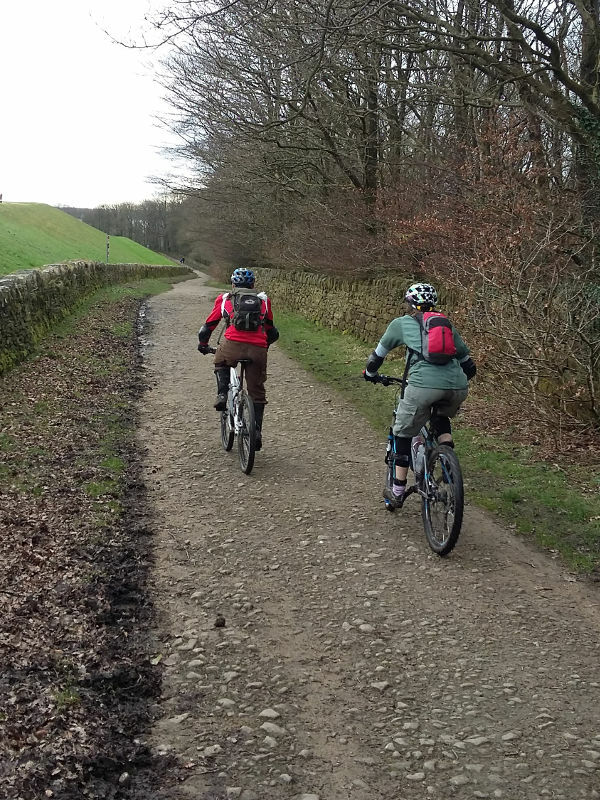 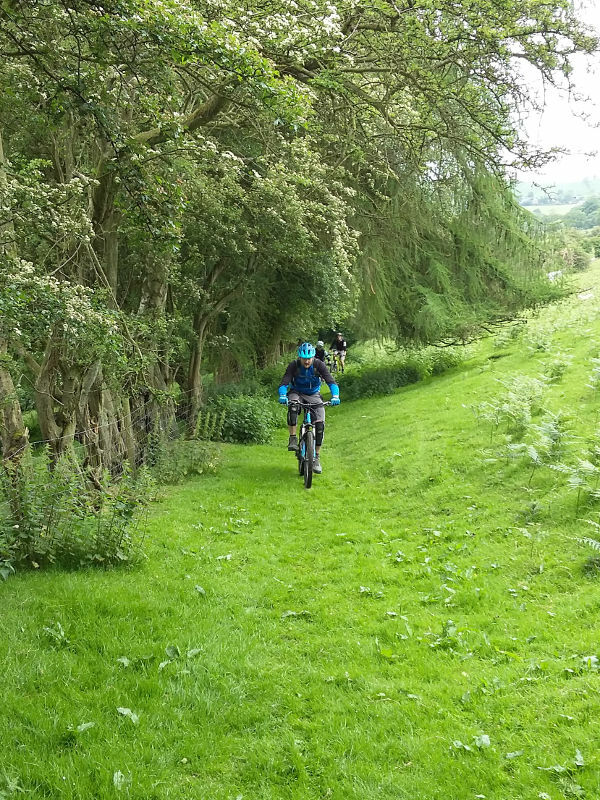 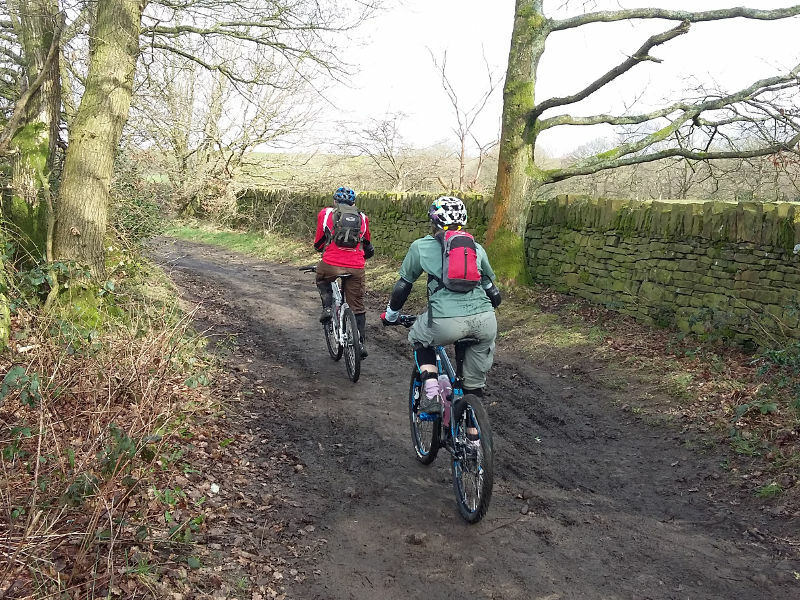 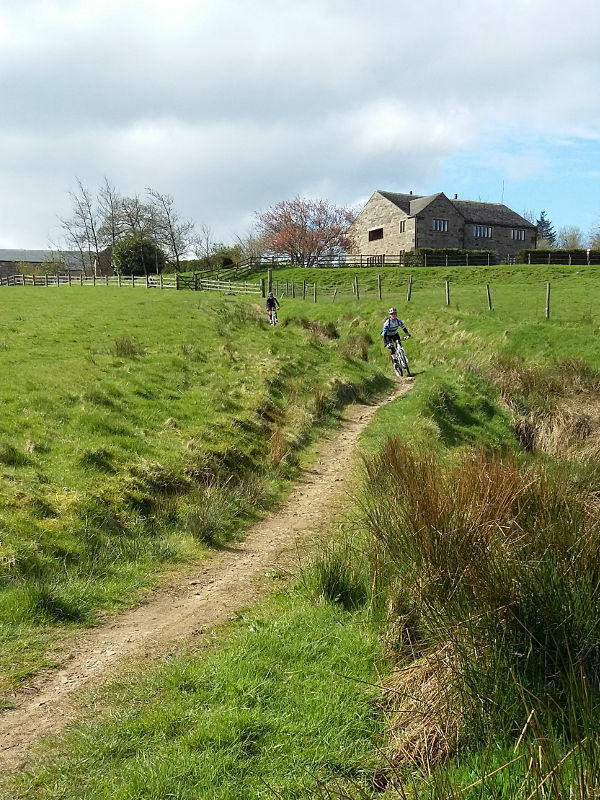 I even got to finally ride a part of the Pennine Bridleway that I had been planning to ride on this route for some time. 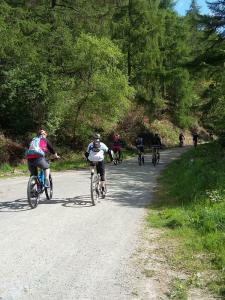 With only two, quite quick, people on this ride I was tired by the end, as taking photos and leading the way meant doing 22 miles of interval training! 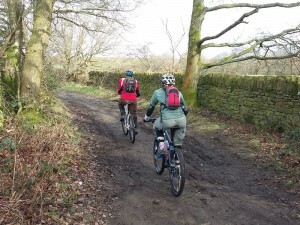 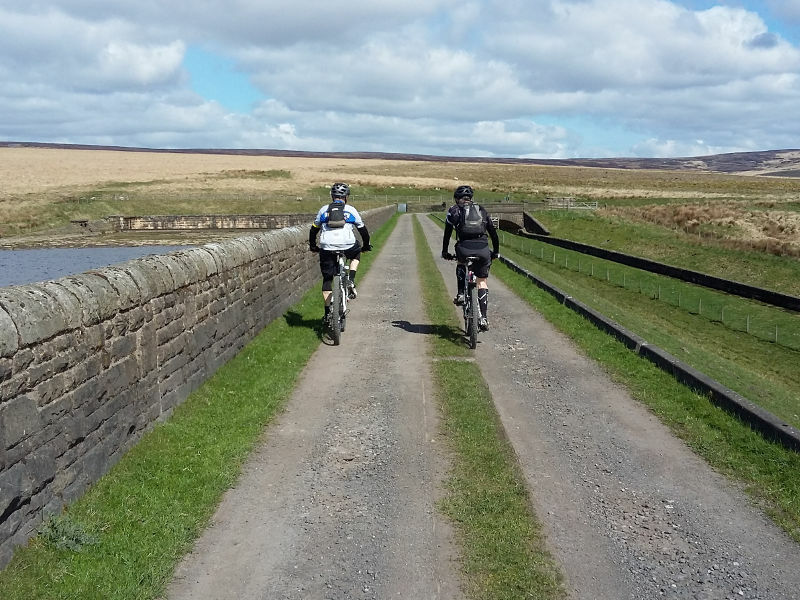 On this ride we followed my Hebden Bridge - Heptonstall Moor route. 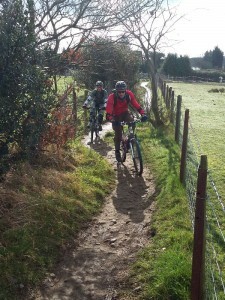 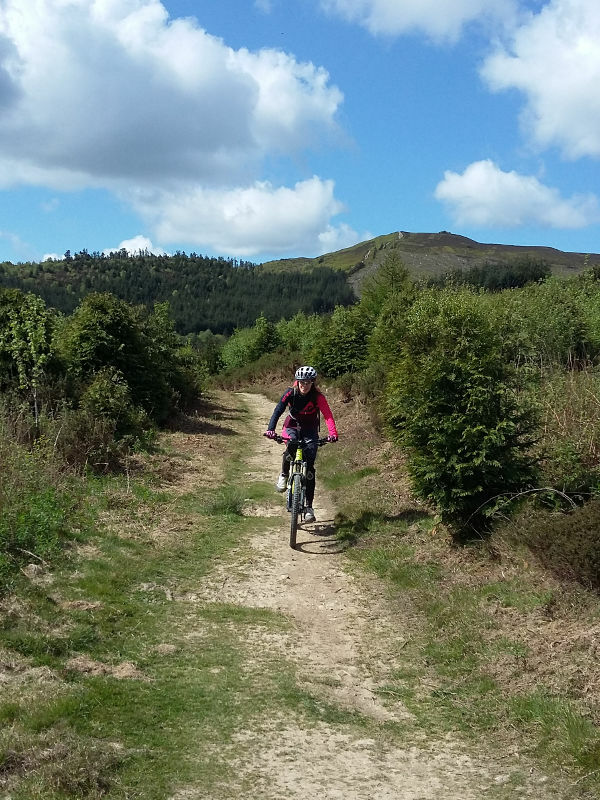 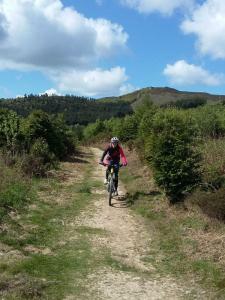 It was a beautiful day in North Wales with blue skies and dry trails. 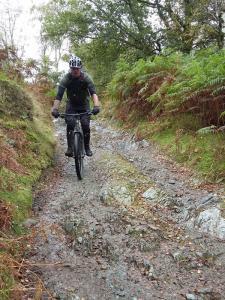 A little bit of rain the day before had damped down the dust so riding conditions were perfect. 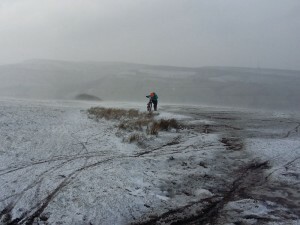 On days like this guiding doesn't feel like work. It was just a great day riding in the hills with a lovely bunch of people. 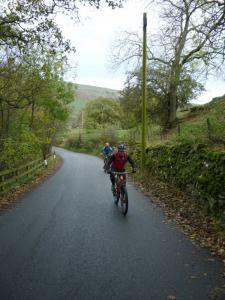 On this ride we followed my Cilcain Circuit route. 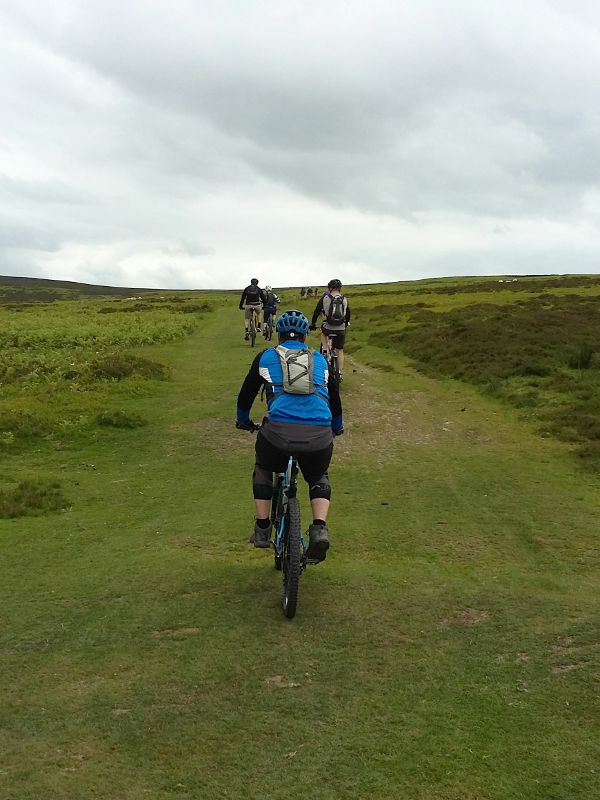 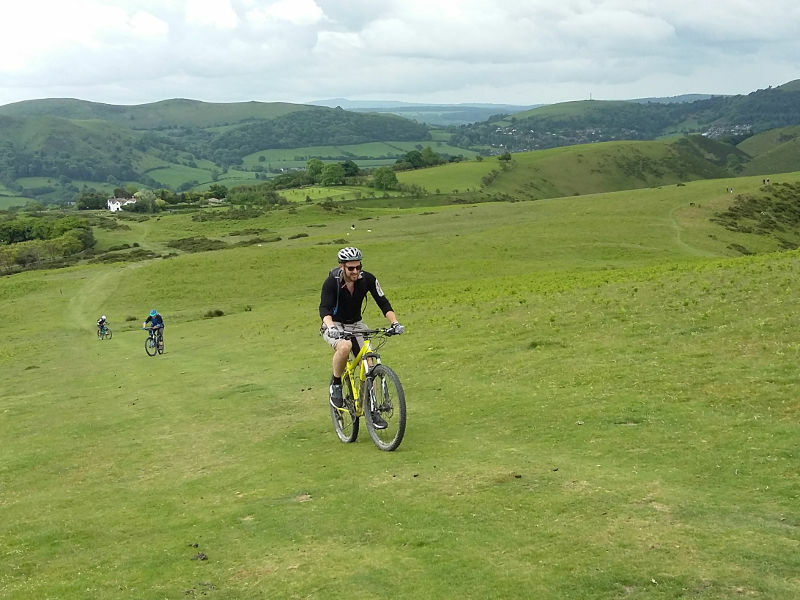 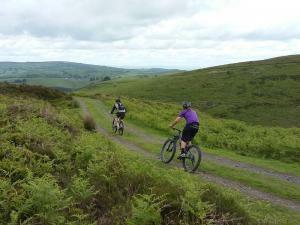 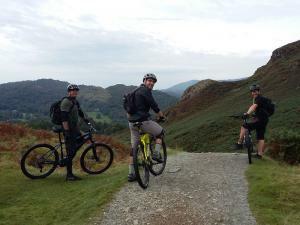 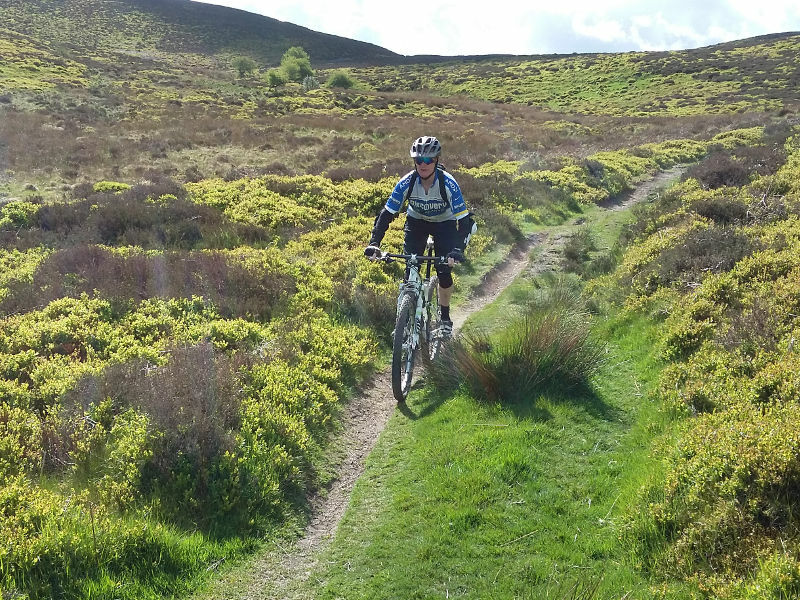 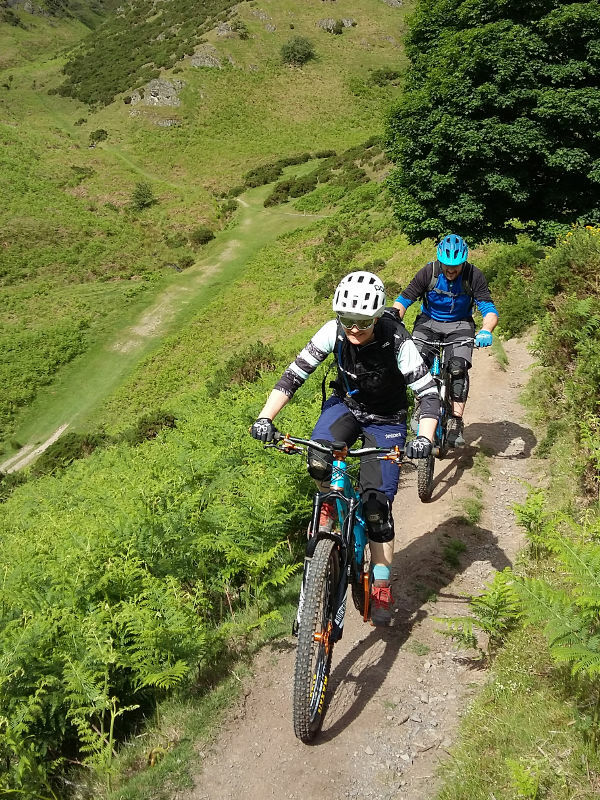 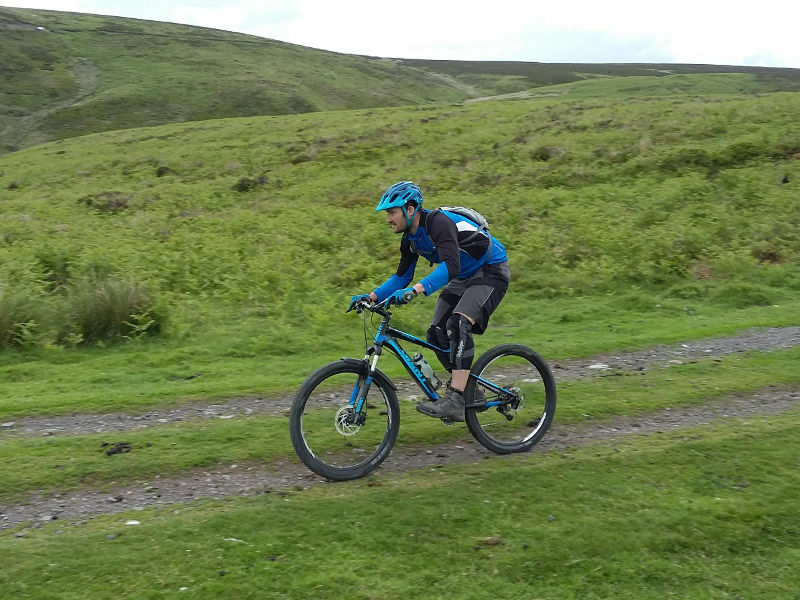 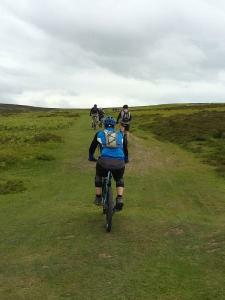 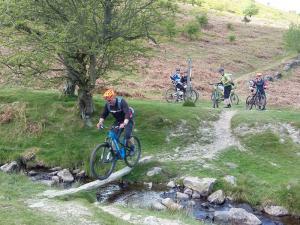 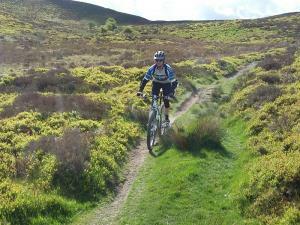 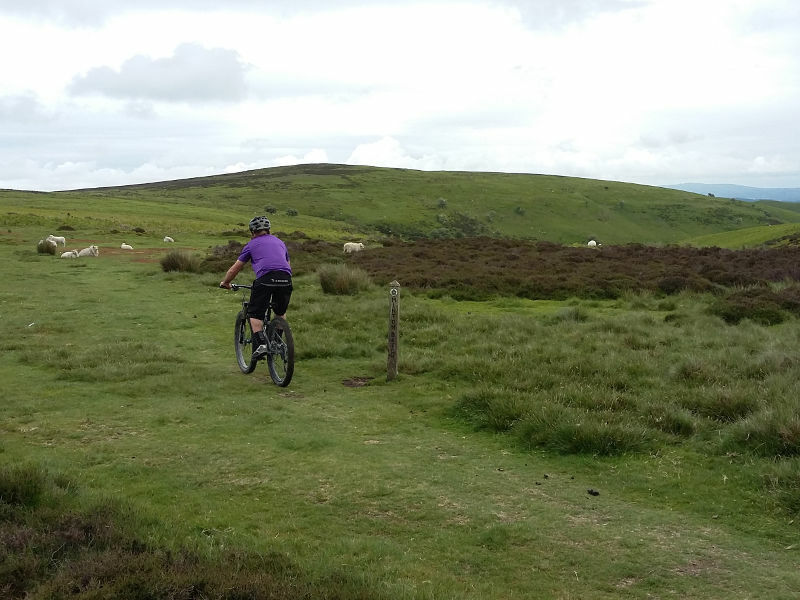 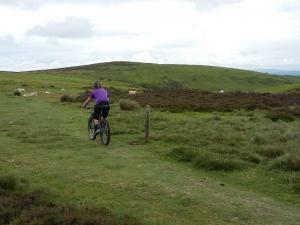 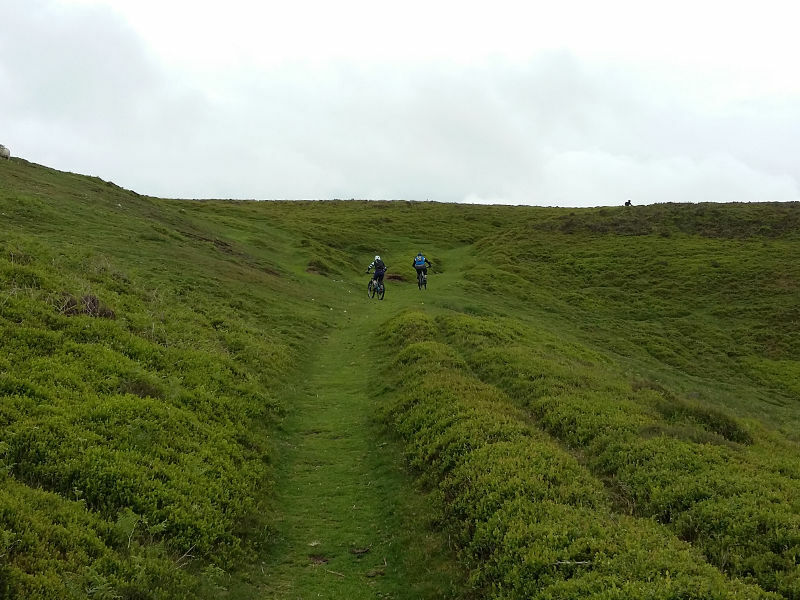 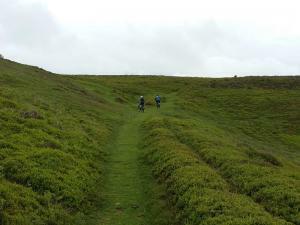 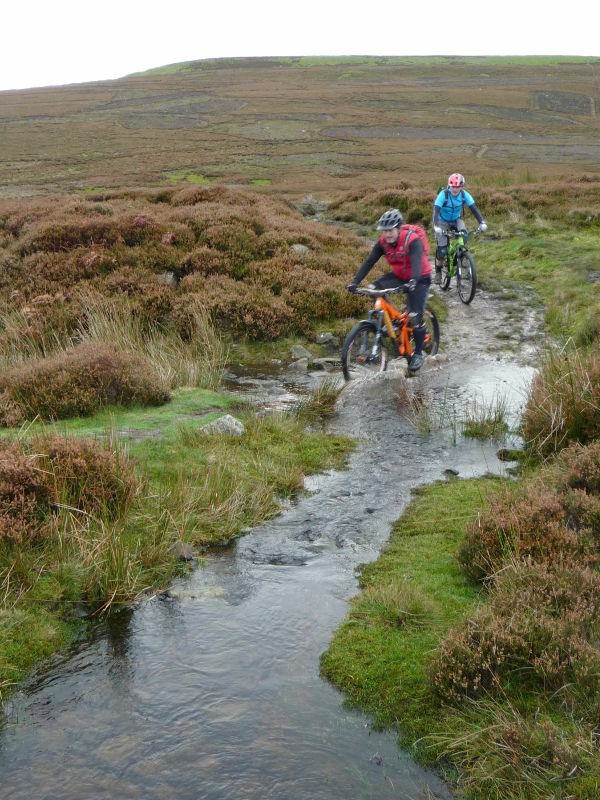 We had a great day on Long Mynd enjoying some of the best trails the hills have to offer. 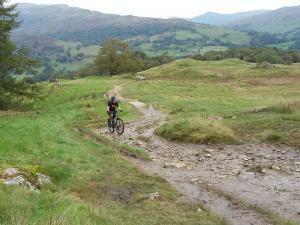 With many riders new to the hills the Minton Batch descent had to be done and it didn't disappoint. I also managed work some guides magic so the heavy rain that was falling all around only hit us when we were safely in the pub for our post ride pint. 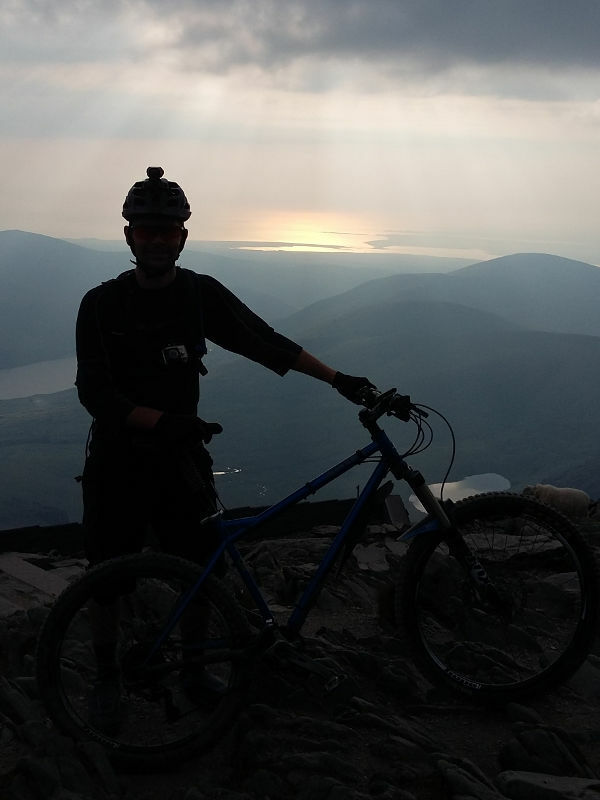 Near the summer solstice I went on a evening ride, to stay within the bounds of the voluntary cycle agreement, on my Snowdon Ranger route. It was such a wonderful evening to ride the mountain. 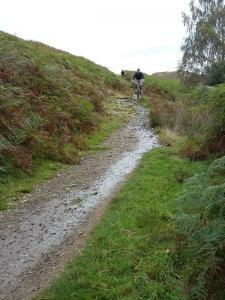 All went well until I hit a hole hidden by grass on the easy bottom section of the Ranger Path. 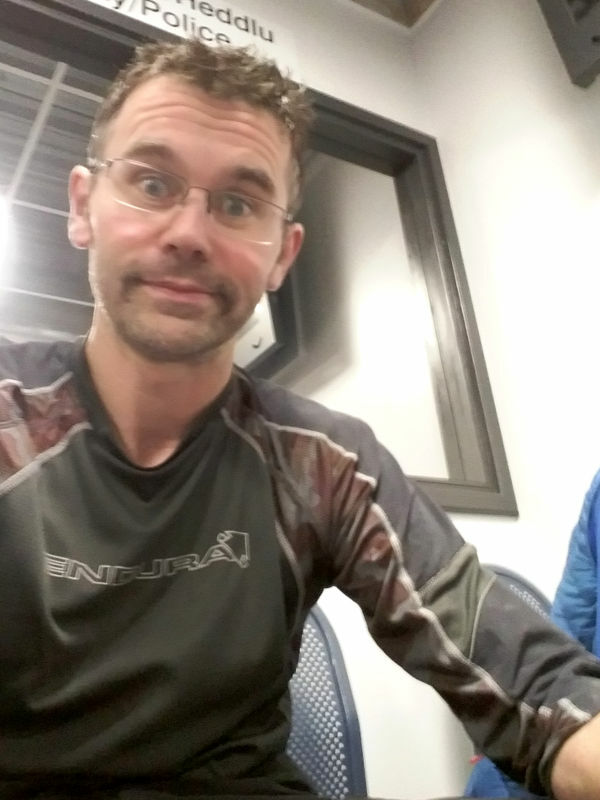 Next thing I knew I was picking myself up from the floor and my shoulder felt very wrong. It took some working out and a bit of swearing but I managed to get back to Llanberis with the help of the fantastic lads I was with, while leaving the volunteers of mountain rescue to enjoy an uninterrupted evening. 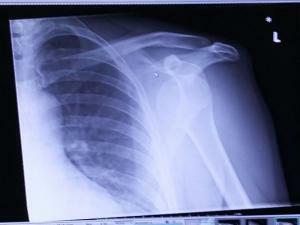 Thankfully my shoulder healed fully from the dislocation and I'm back to 100%. 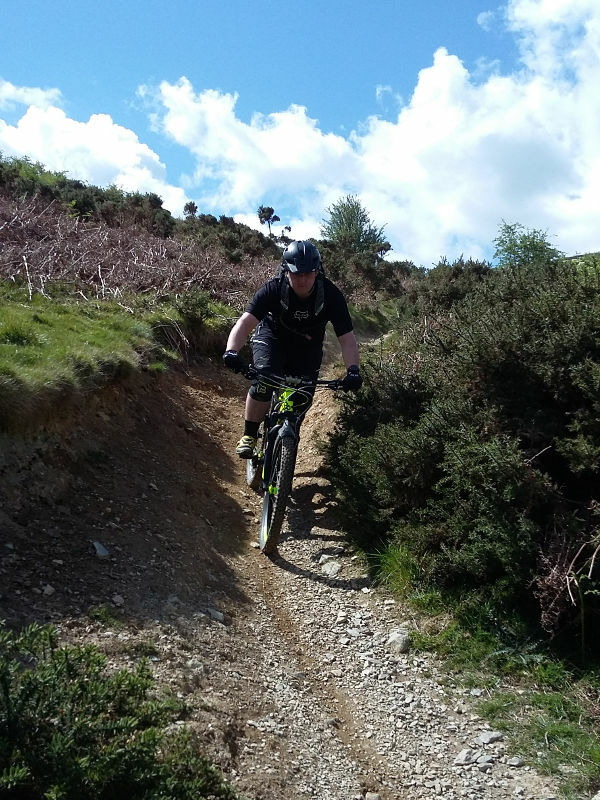 This was my first proper 'mountain' bike ride since dislocating my shoulder. 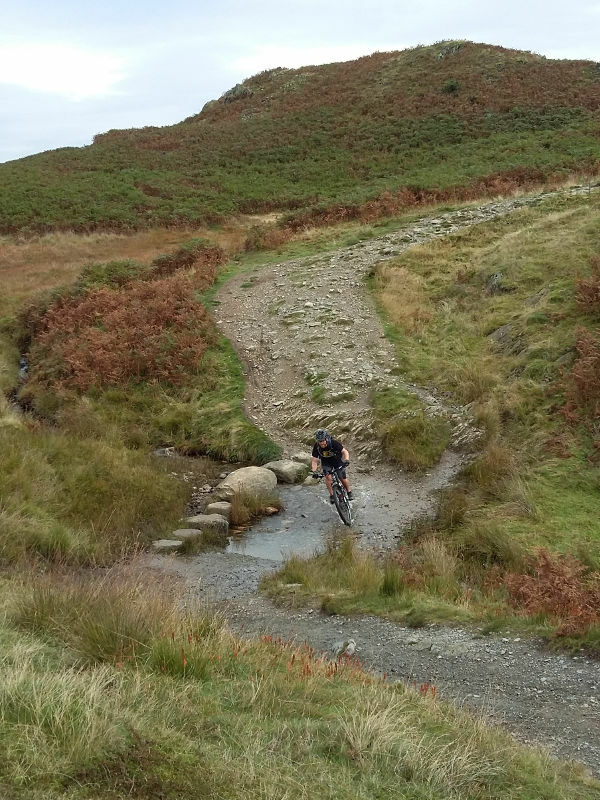 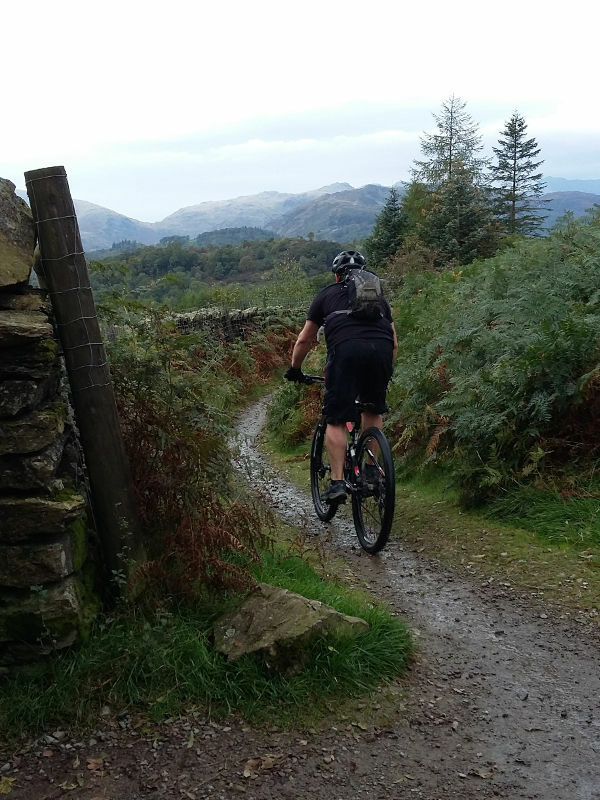 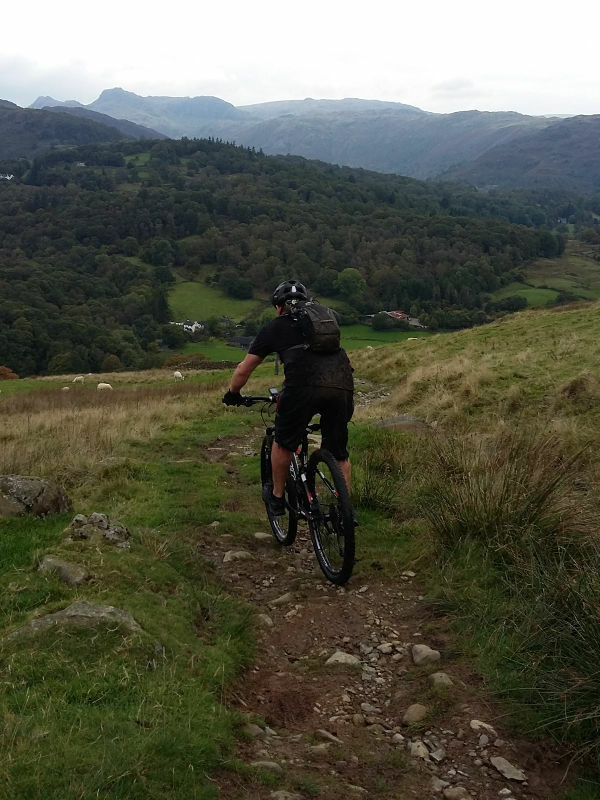 While the email conversation led to the idea of an XC ride once I met John, saw his bike and had a chat a quick change of plan saw us take on the Pont Scethin route. Thankfully my shoulder held up on the rocky trails and I had a great time riding with John. 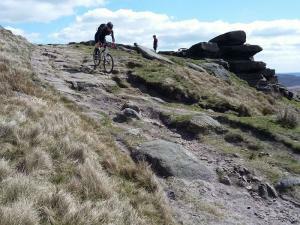 After all the previous rain we seemed to enjoy a bonus day of summer with warm air and great views. 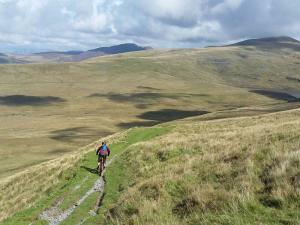 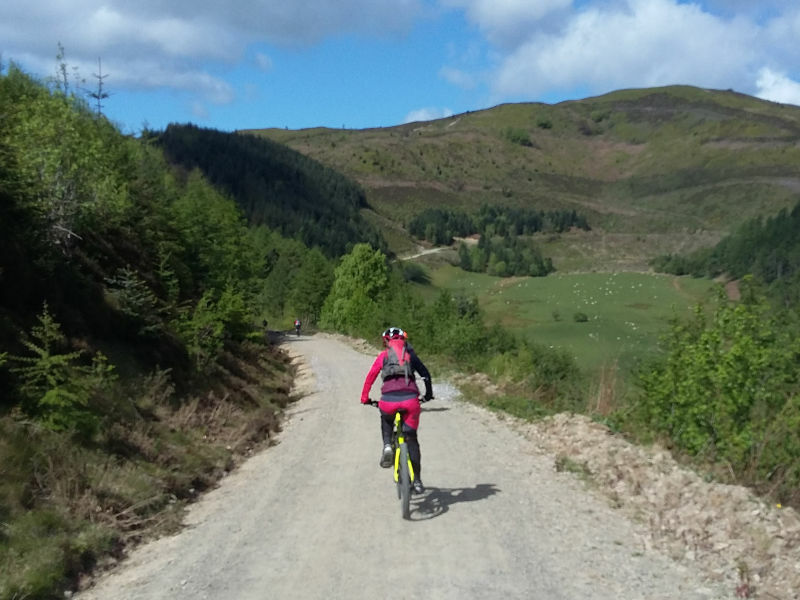 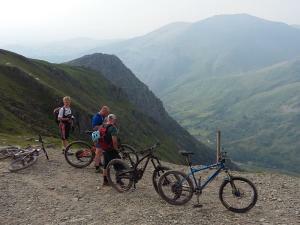 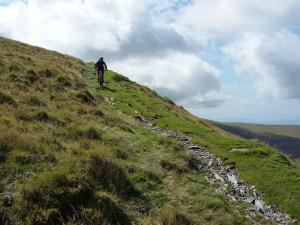 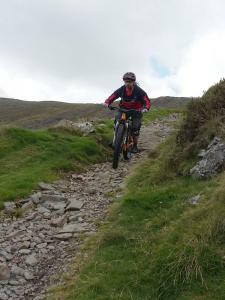 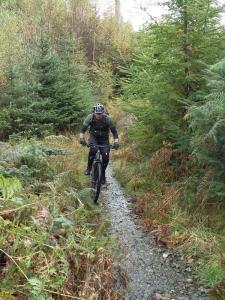 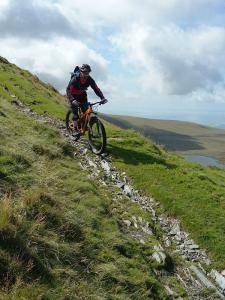 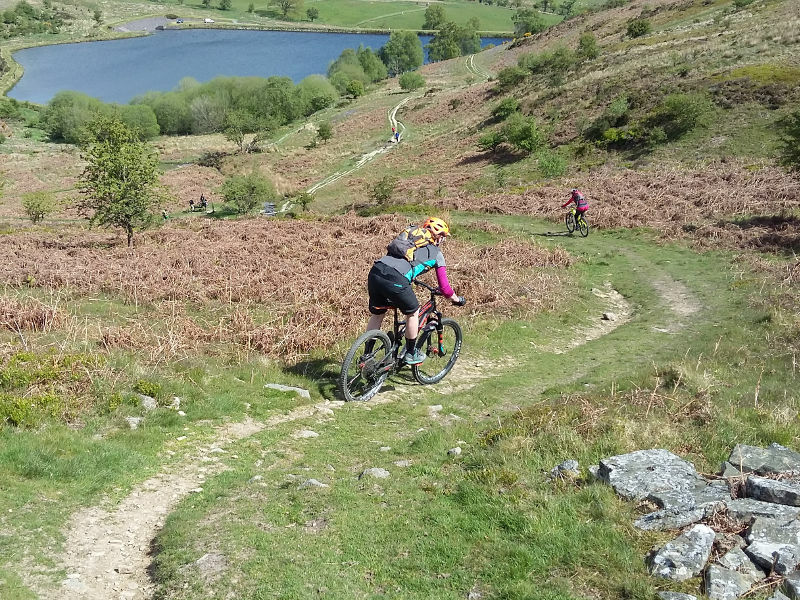 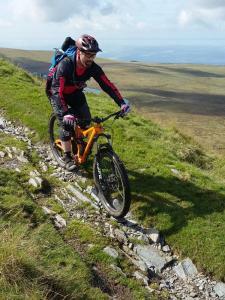 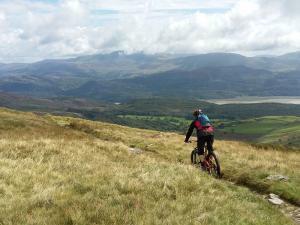 All the better for enjoying some of the best trails in Snowdonia. 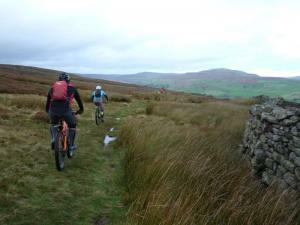 For the first day of the Swaledale weekend I guided Brian and Karl around my Fremington Edge route. 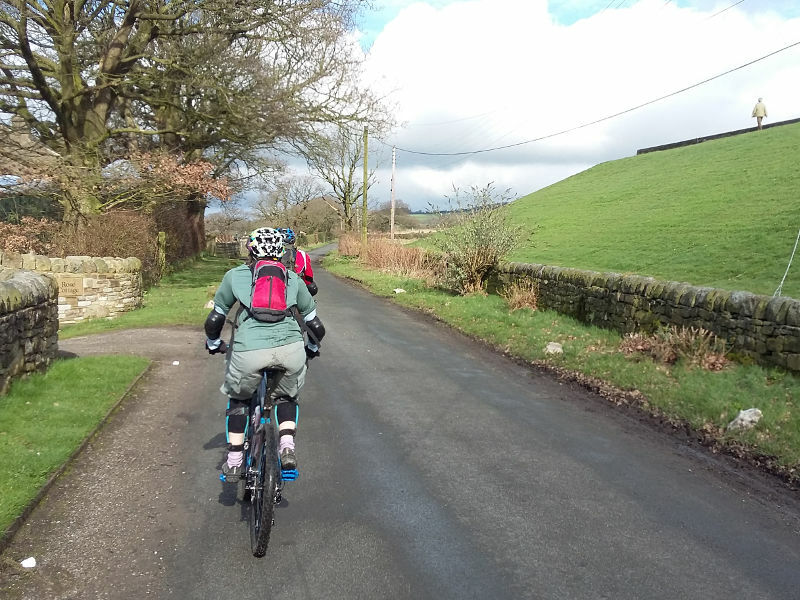 We had driven through rain and fog to get there but the skies cleared on our arrival, so we were blessed with blue skies for the ride. 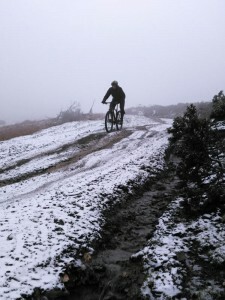 It was wet on the ground but the riding was still fun. There was also the feeling of more danger when occasionally being surrounded by fleeing grouse with shooting going on all around. 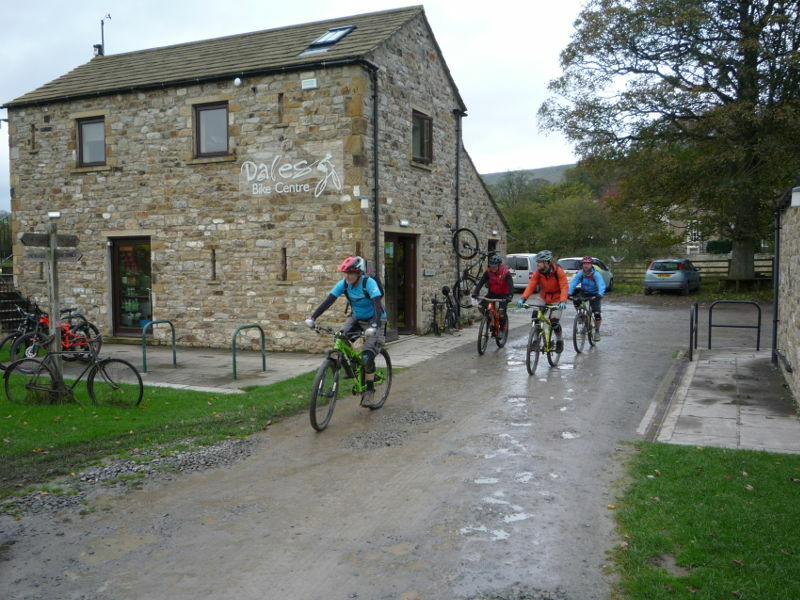 After our ride we settled into the wonderful Dales Bike Centre before heading to the pub. 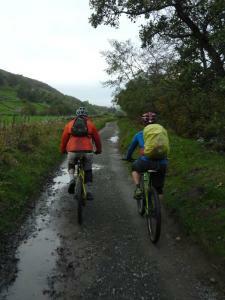 Day 2 of the Swaledale weekend saw five of us tackle my Gunnerside Gill and Apedale route. 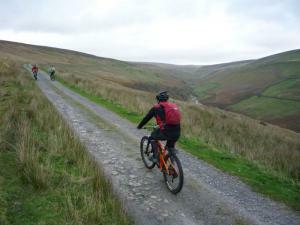 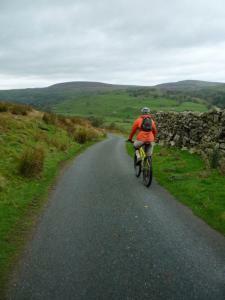 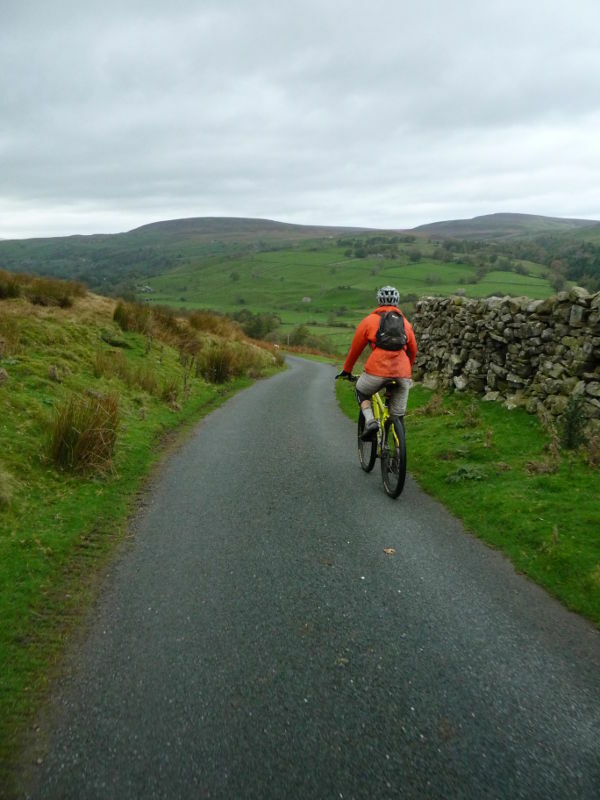 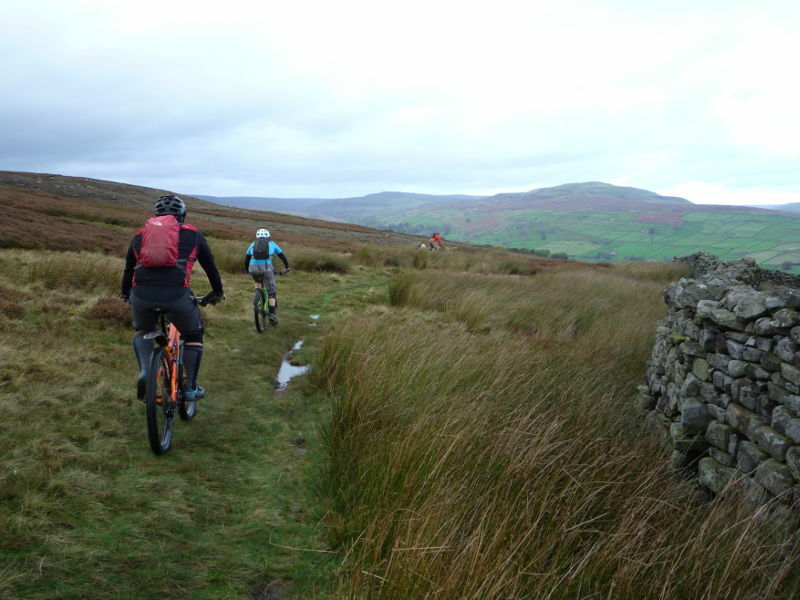 The initial ride up the valley was quite nice, with the wind at our backs, and so was the climb up Gunnerside Gill. 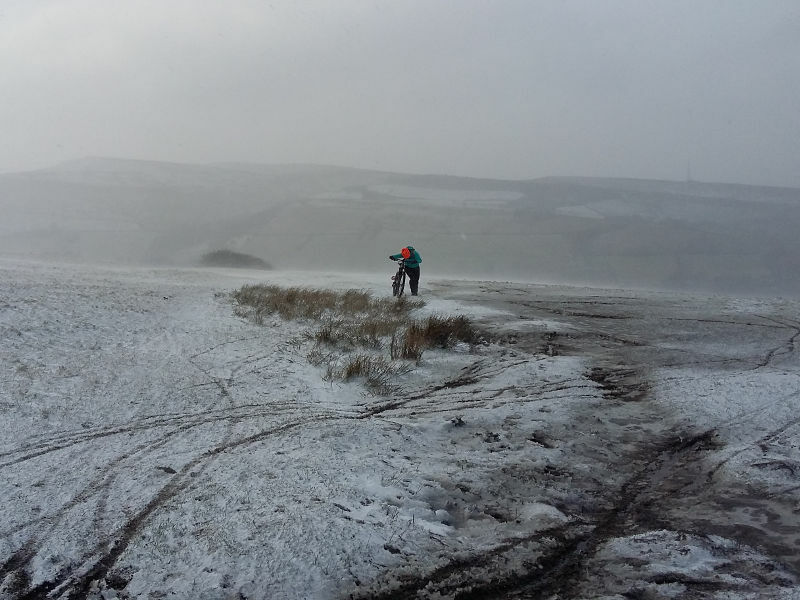 But that's when the weather came in. The descent down the other side was sodden and into a head wind, which is where the ride slowed down. 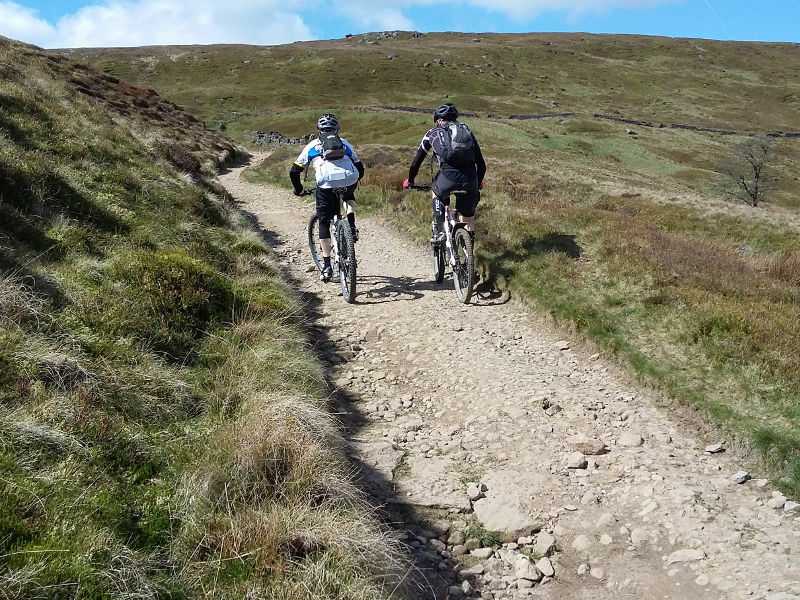 On finally returning to Gunnerside Brian and Karl were beat, it was their second day of riding, so they headed back. 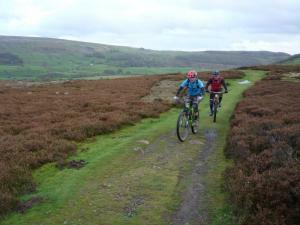 Me, Graham and Chris then went off on the final third of the ride. Near the top of the next big climb storm Brian hit us full force. There was no shelter and the quickest way back was to complete the ride. Character building stuff my dad would say. 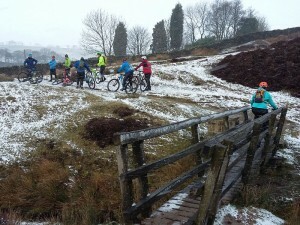 We finally reached the end of the ride after 6 hours and were never so glad to see a roaring fire on in the pub! 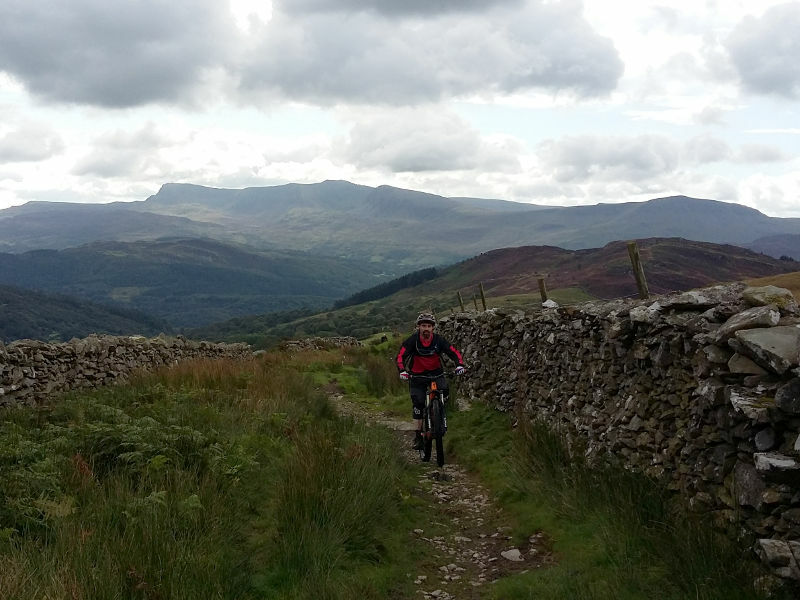 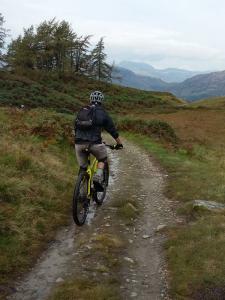 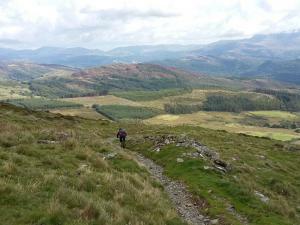 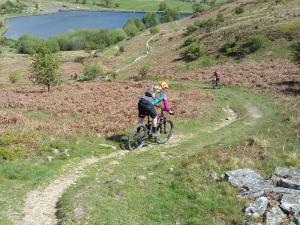 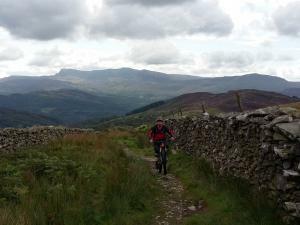 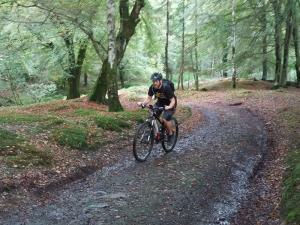 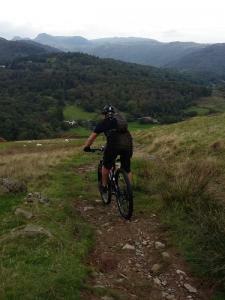 This ride followed my 'Marin and Moel Siabod' route. 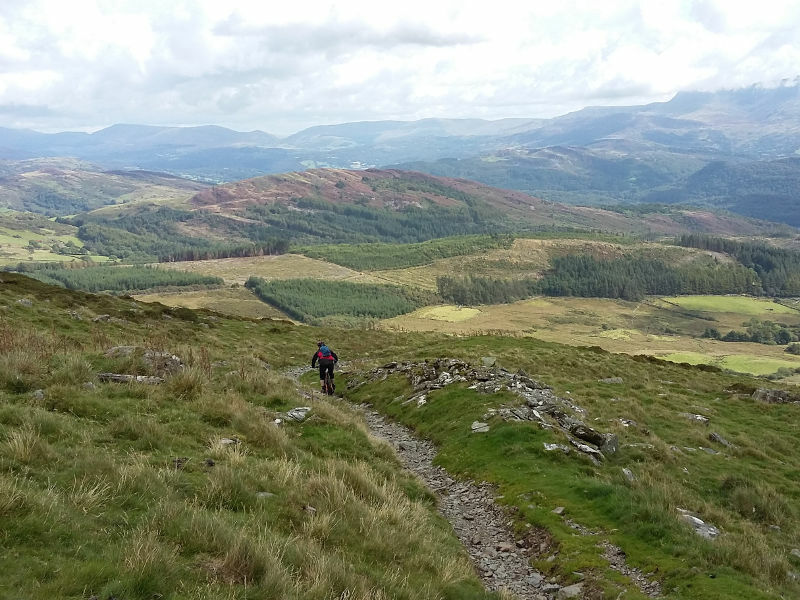 The Marin Trail has now changed it's name to Gwydir Mawr but I'm sorry, it'll always be The Marin trail to me. 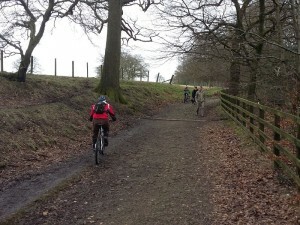 It was a ride where I earned my keep (so to speak as the Social Rides are free). It was cold and the rain came in halfway round, usually good riders were struggling with the after effects of illness which spread out the group, a plus size tyre got punctured which takes some while to get pumped up, trails were closed for felling and Martin's e-bike took him on a mystery tour. 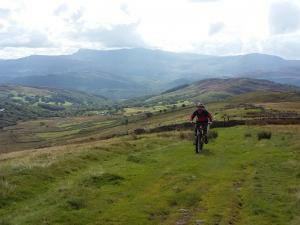 Strangely this just added to the 'out in Snowdonia having an adventure' feel of the ride. 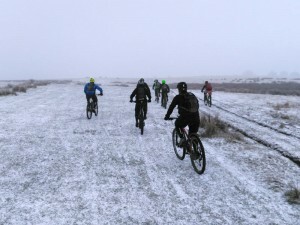 While many of the group didn't know each other they all pulled together and spirits stayed high. 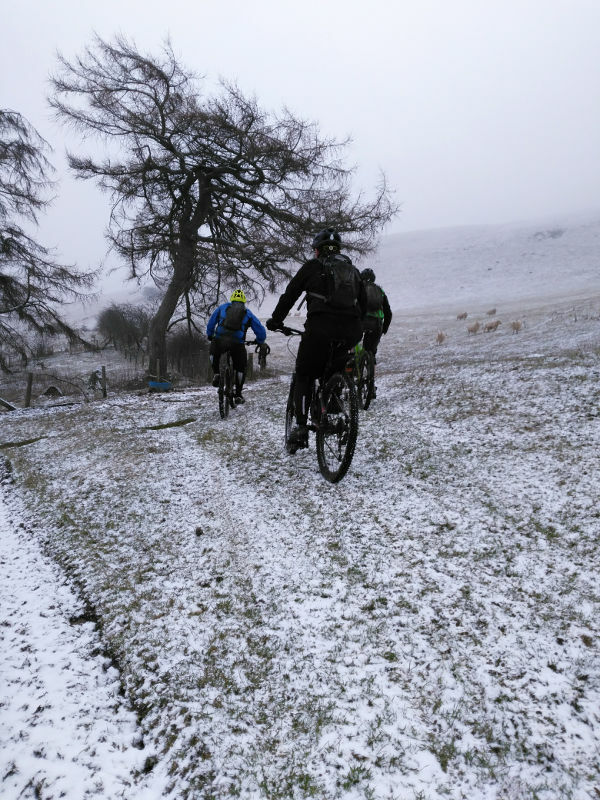 We all made it back, with cold fingers, not having completed the whole ride but with big smiles as we'd had a great day riding in the mountains.